The Man Behind the Mann | the Mann. Since I was a young girl, I knew there was something electric and powerful about my grandfather. I didn’t know what he did, but I understood that he was a special person with an unusual ability to be the center of attention. 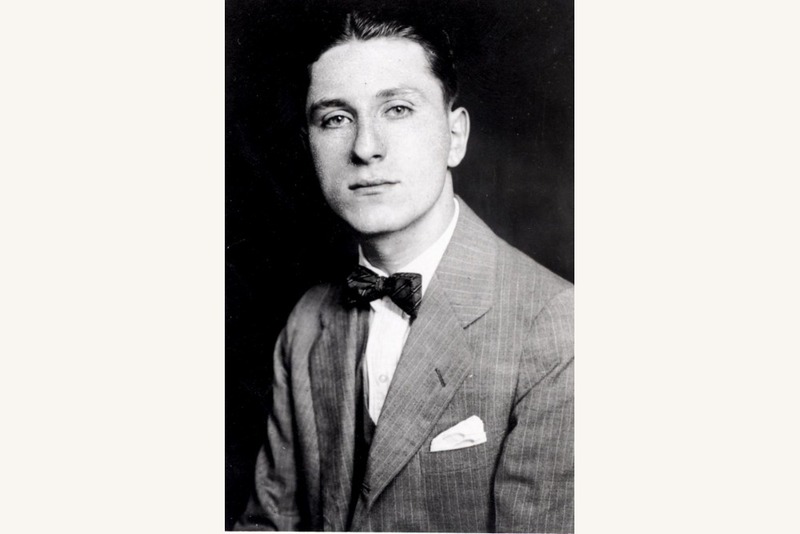 His best friends were the greatest musicians of his day with whom he summered in Elizabethtown, New York: Artur Rubinstein, Jascha Heifitz, Mstislav Rostropovich and Gregor Piatigorsky. 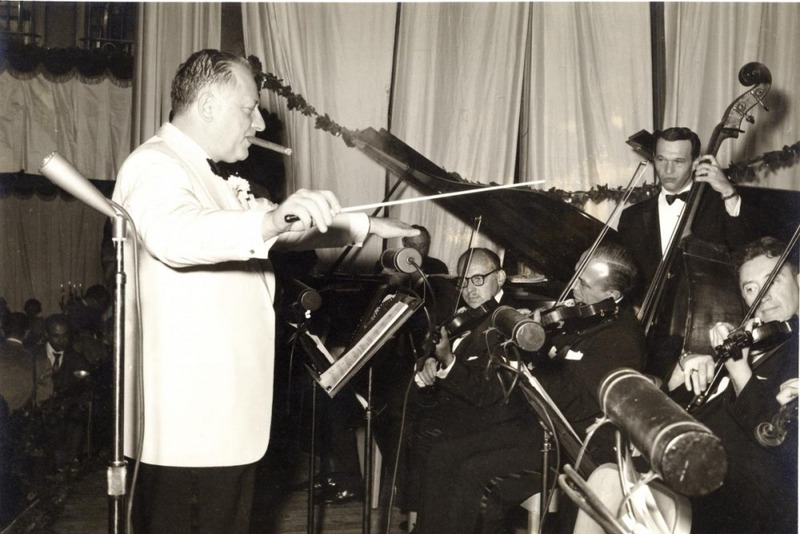 He was instrumental in founding the Palestine Symphony Orchestra, now known as the Israel Philharmonic Orchestra, whose home venue is the Fredric R. Mann Auditorium in Tel Aviv. He devoted tireless efforts to mentor the careers of young musicians, such as Zubin Mehta, whom he brought to Philadelphia for his United States conducting debut with The Philadelphia Orchestra at the Robin Hood Dell, and William Kappell, considered one of the great pianists of his day until he died tragically in a plane crash at 31. 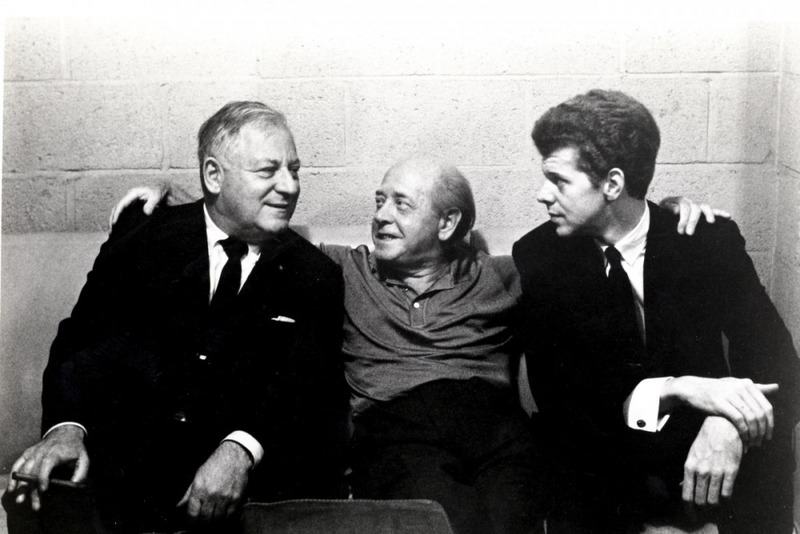 On any given day, Isaac Stern, Beverly Sills, Itzhak Perlman, or Pinchas Zukerman might be dropping by his apartment for a visit, or Van Cliburn or Daniel Barenboim might be calling in to say hello. It wasn’t until I became an adult that my relationship with my grandfather deepened and I understood what was so special about him and why people of such enormous talent were so drawn and devoted to him. Yes, he was a successful businessman who built and sold two corrugated box companies, but there were those far more successful. 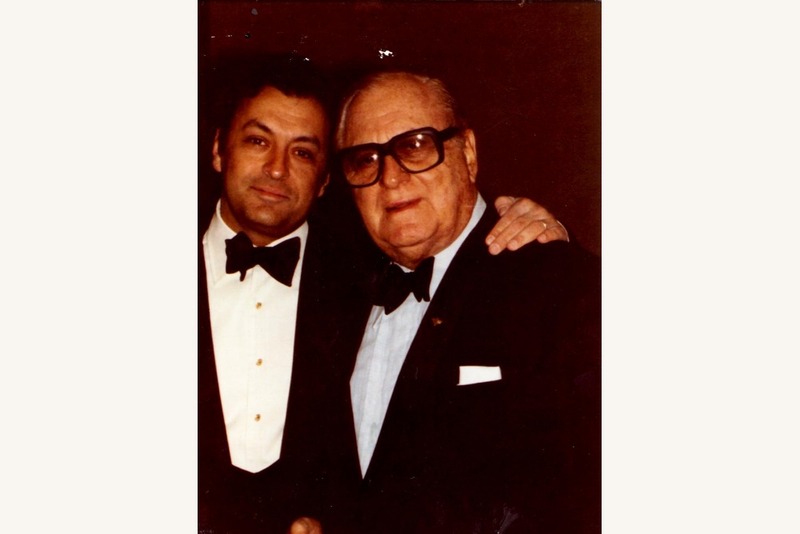 To him, the businesses were simply a means to fund his true loves: music, the cultural lives of his adopted City of Philadelphia and the State of Israel, and public service. The money he made he selflessly poured into these passions, and he was as generous with his time. He never ran for public office, but rather devoted his public service efforts in ways that he felt he could make meaningful contributions, and he served as City Representative, Chairman of the Fairmount Park Commission and the country’s first Ambassador to Barbados. 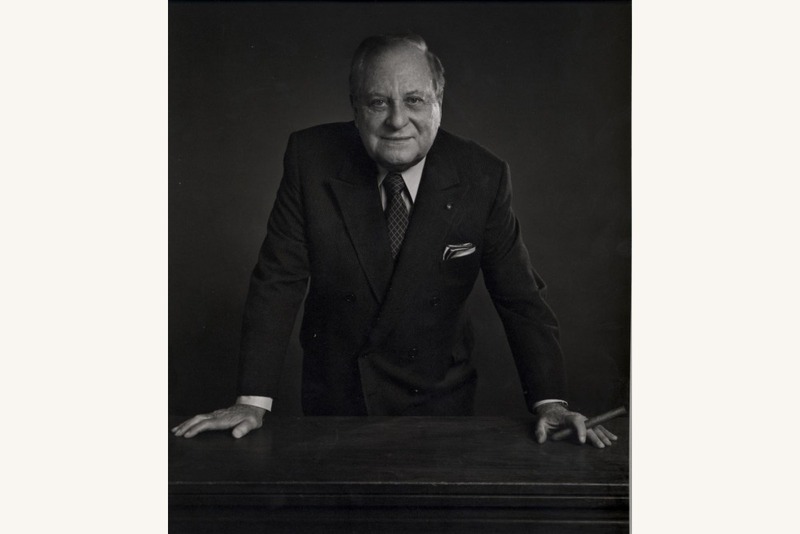 His greatest lifelong effort began in 1941 as a director of the Robin Hood Dell, which he saved from the brink of financial disaster and which later moved to Robin Hood Dell West, now the Mann Center for Performing Arts. But this list of accomplishments does not account for the love that he received from the great classical musicians of his day. What made my grandfather stand apart was that he was the most energetic, outrageous, constantly hip and entertaining person I’ve ever met. Behind his raspy, mumbling voice, his ever-present cigar that I can still smell, and at times clownish personality was an extraordinary wit and intelligence. He never grew old. He was always with the times and possessed an unending sense of style and youth. An accomplished pianist, his musical tastes were well honed and sophisticated. A politically active Democrat locally and nationally, he was totally engaged and opinionated. Even in his 80s, he had more energy than my friends 50 years his junior. He required little sleep and was known to stay at restaurants until the closing hour or to call their owners to open their doors late into the night so he could entertain his musicians after they performed. If my phone rang at 2 in the morning, it was just my grandfather looking to talk. It was his uninhibited love of life and over-the-top personality that made him so irresistible and kept his friends constantly entertained and wishing the night would never end. As I remember him playing affectionately with his odd-looking dogs that no one else seemed fond of, and strolling with delight among the music lovers sitting on blankets who came to the Top of the Hill at the Mann to enjoy a summer’s night of classical music, it’s all so clear that he was always the precocious child of Russian immigrant parents with a devilish grin and wide-eyed enthusiasm for the pleasures that life had in store. I will always miss him and my biggest regret is that my children never got to meet him. A Young Fred Mann, perhaps taken while he was studying at the University of Pennsylvania here in Philadelphia. 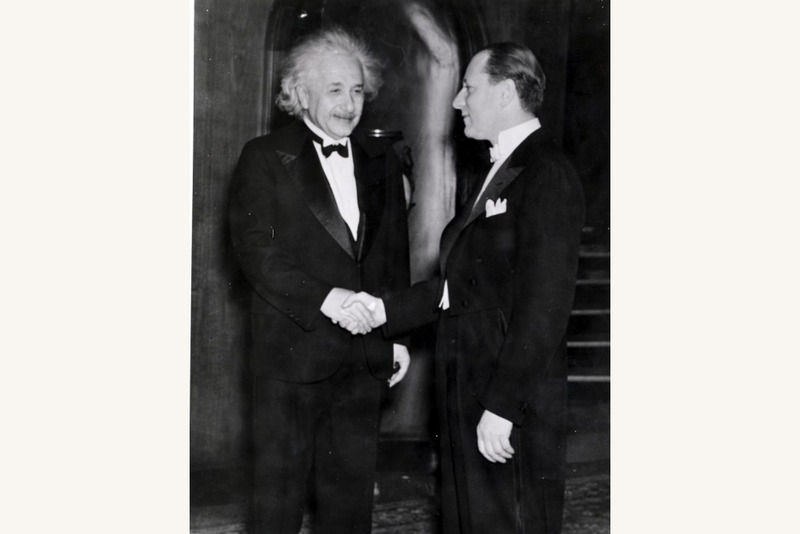 Fred Mann shakes hands with Albert Einstein. 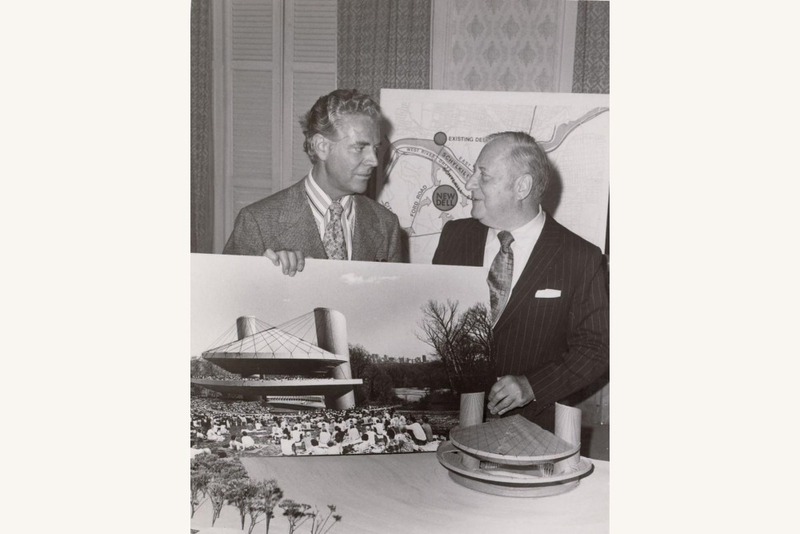 Fredric R. Mann (pictured right) reviews one of the proposed plans for the new Robin Hood Dell West, which is now The Mann Center for the Performing Arts. 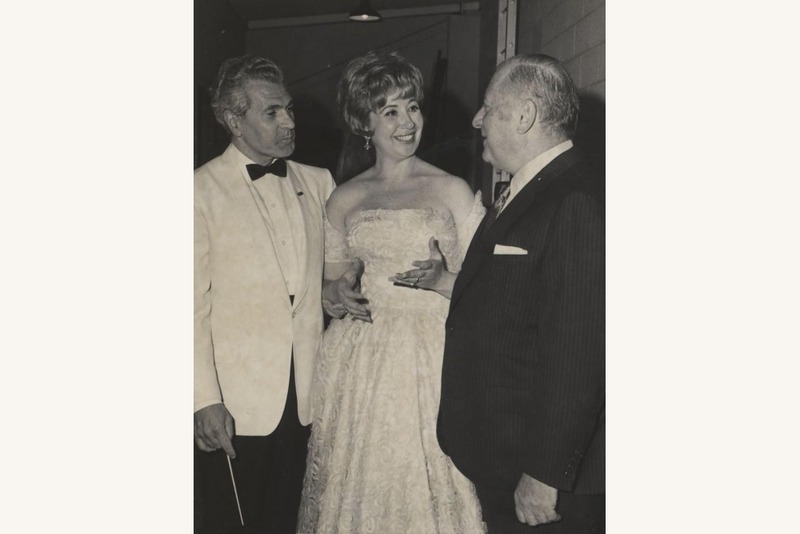 Julius Rudel, Beverly Sills, and Fredric R. Mann talk backstage.